6th Rolson Travel Mug | What Car? On a par with the fifth-placed Sainsburys TU after two hours the Rolson had managed to retain 49C. Although the seal around the lid is waterproof, if you knock the cup over then liquid will seep through the drinking hole. Simply slide back a flap on the lid and take a swig. The handle makes the Rolson easier to pick up, and the plastic holder might come in handy. Three of the cups we tested were priced at around the 3 mark, which sounds great value. However, unless youre going to make use of the plastic holder (included in the price) we cant see any reason not to buy the Thermos Thermocafe instead of the Rolson. 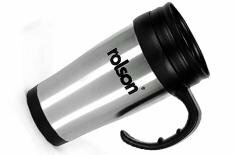 Like many of the cups we tested the Rolson has a brushed metal case, but the plastic lid, handle and base felt a bit cheap compared with some of the other mugs. Comes with a plastic holder, which is useful if your car doesnt have any cupholders, or you want to hang it somewhere other than in your car.